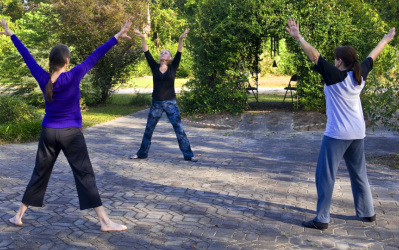 The Qigong Self-Care Curriculum for 2013 is a complete study and practice of the ancient healing art of Qigong with its roots in Traditional Chinese Philosophy. The once per month 2-hour Healer Within series will include a more in-depth study of the Theory of Five Elements, Twelve Meridians, and Yin & Yang as it relates to the practice of Qigong. The practice, which will also be offered 3 times per week, will include Sunning, a set of Qigong movements, Do-In Self-Massage (Tapping), and Microcosmic Orbit Meditation. Wednesday evening class will include Tai Chi. Long ago in lands far away (Europe, China, India, America, South America) people learned how to sustain their health and their family's health with herbs, food, gentle movements, self-massage, breathing techniques and meditation and prayer. These traditions have been preserved in all cultures. Some cultures have collected and recorded this information better than others. Some people were called witches when they passed on this information, and that is why some of the information went under cover in Europe for years. China, India and other countries preserved their self-care knowledge. Qigong is one of these systems that has been sustained through the ages as a self care and "people's medicine" system for thousands of years. The foundation of a self-care system includes self massage and tapping (Do-In), food and herbs for healing, mindfulness, meditation, visualization, prayer, gentle movements that can be done for the entire life span, fasting, cleansing and conscious breathing practices. We hope you will come and join us on this fascinating journey of self-care to deeply nourish your body and mind.